As children enter, they are welcomed by a small bridge under a trellis to cross into the classroom. 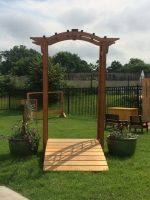 We plan to have vining plants next year, but this year we are happy to have potted plants framing the bridge and making a beautiful entry for the children. 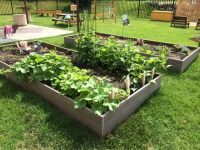 Our gardens are located near the bridge and are currently growing flowers and vegetables! The children enjoy digging and exploring the gardens with magnifying glasses and bug catchers. Our gathering area is under a shade canopy. We hold our group times in this space, but children also enjoy puzzles, sidewalk chalk, books, games, as well as lounging on soft pillows in this area. 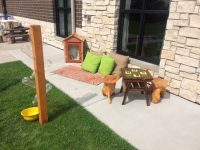 The building area is near our sidewalk and includes many interesting natural and found objects for the children to enjoy. This area is ever changing as we find new items to incorporate on a regular basis! The messy materials area includes boards, buckets, wood rounds, ramps & balls, as well as milk crates. These items will be switched-out and rotated often. Much engineering, collaboration and creativity take place in this space. We are lucky to have a small world play space, (created from a cable spool) as well as a sandbox in our classroom. 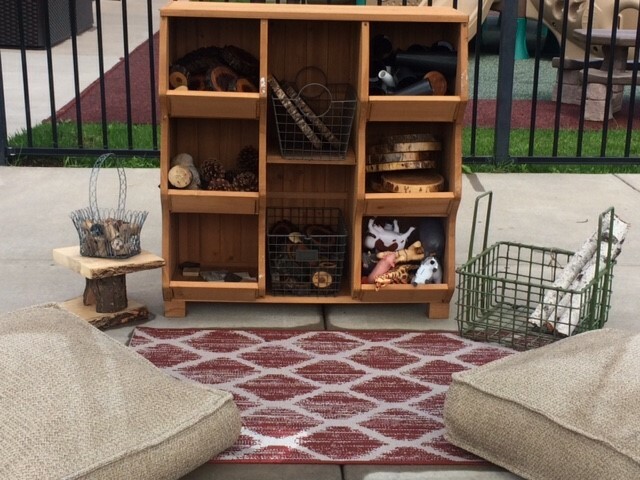 Both of these areas incorporate many natural and found loose parts. 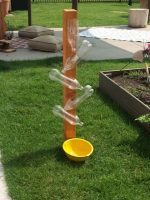 The children can easily interchange these items in either area. 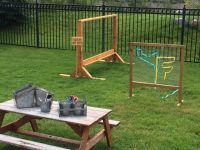 Our Nature Art area includes a plexi-easel for the children to paint and explore light and color, as well as a weaving wall. Natural items of pinecones, seashells, rocks, wood rounds are available to pattern and create. Our music and movement area includes a stage, scarves, dancing ribbons, and instruments. Currently we are in the process of making a wooden xylophone to accompany this space! Next to this area is our Action Area & our climber. 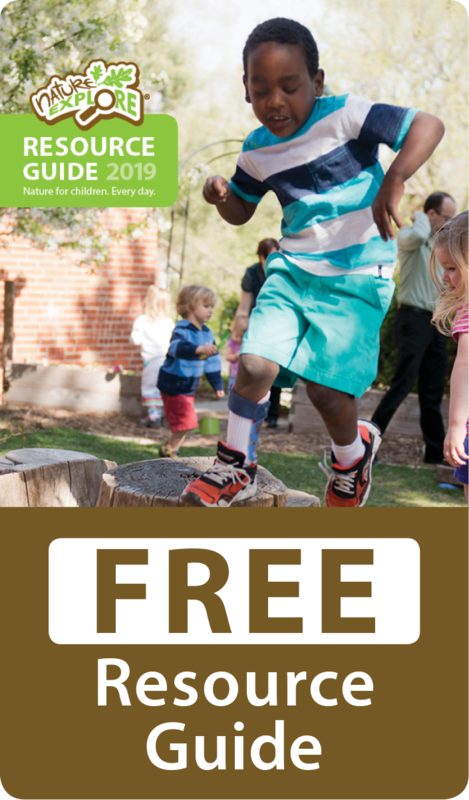 We look forward to enjoying our space the rest of summer and into fall!